Join us in marking the longest day of the year. Ancient traditions come alive as California Revels presents costumed dancers, singers, mummers, and other family-fun welcoming the first day of Summer. Bring a blanket, your picnic basket, and an appetite for enjoyment. It’s lots of fun and completely free! We meet at the Pergola on Grand Avenue and El Embarcadero , within sight of the Grand Lake Theatre. All are welcome to participate in this day of song and merriment. The open mic style of our summer celebration event invites anyone with a song, dance, short story, poem, or other act to join in to make this longest day of the year memorable. What can you bring to the party? Do you juggle? Can you lead a spiral dance? If you have a group of friends or a solo act you think might be fun, drop an email to office@californiarevels.org . 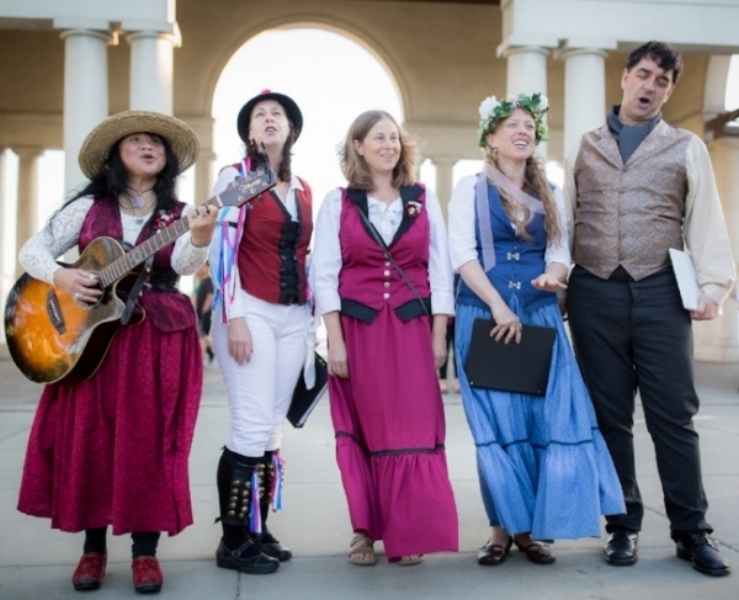 The California Revels Solstice Ensemble is set to sing throughout the evening, including some songs which you can join in. Dance down the sun with our Morris Dancers, the Deer Creek Morris. They have partnered with California Revels for over two decades, and will be there with bells on. Literally. We hope you'll be there, too.